HARRISBURG, PA – The American Civil Liberties Union of Pennsylvania, the Advancement Project, the Public Interest Law Center of Philadelphia (PILCOP), and the Washington, DC law firm of Arnold & Porter LLP filed a lawsuit today on behalf of ten Pennsylvania voters and three prominent advocacy organizations, alleging that the state’s voter photo ID law violates the Pennsylvania Constitution by depriving citizens of their most fundamental constitutional right – the right to vote. The plaintiffs are asking the Commonwealth Court to issue an injunction blocking enforcement of the law before November’s election. If the law is not overturned, most of the plaintiffs will be unable to cast ballots in the fall, despite the fact that many of them have voted regularly for decades. The lead petitioner in the lawsuit is Viviette Applewhite, a 93-year-old African-American great-great grandmother and resident of Philadelphia who marched for civil rights with Dr. Martin Luther King, Jr., but cannot get an ID needed to vote under the law. Other petitioners include Philadelphia residents Wilola Shinholster Lee, Gloria Cuttino, and Dorothy Barksdale, all African-American women born in the Jim Crow South who, like so many of their generation, were never issued a birth certificate they now need to get an ID in order to vote under the law; Nadine Marsh, a Beaver County grandmother; and Grover Freeland, a Philadelphia-area retired veteran, whose veteran’s ID card will not be acceptable to allow him to cast a ballot. If the voter photo ID law is not struck down, none of them will be able to vote in November – despite the fact that many of them have been voting for decades. Under the state’s voter ID law, signed by Gov. Thomas Corbett on March 14, 2012, voters casting ballots in person will be required to present ID from a limited list of photo IDs, including PennDOT-issued driver’s license or non-driver ID or government-issued employee ID. Even many otherwise acceptable photo IDs, such as those issued by Pennsylvania colleges and universities and the Dept. of Veterans’ Affairs, will not be accepted because they lack the required expiration dates. “The commonwealth is wrong to suggest that photo identification is necessary to protect the integrity of elections. It is not. What threatens the integrity of elections is the commonwealth purposefully disenfranchising citizens who are qualified to vote under the Pennsylvania Constitution, are registered to vote and who as in the case of many of the plaintiffs in this lawsuit, have in fact voted regularly for decades,” said David Gersch of Arnold & Porter LLP of Washington D.C., one of the plaintiffs’ lawyers. The organizations that have joined as plaintiffs are the League of Women Voters of Pennsylvania, the National Association for the Advancement of Colored People (NAACP) Pennsylvania State Conference, and the Homeless Assistance Project. These groups devote substantial resources to eliminating barriers to voting and are currently swamped with requests for help in obtaining identification. Petitioners in the case demonstrate a variety of different problems with the law. Pittsburgh resident Henrietta Kay Dickerson was required by PennDOT to pay for the ID because her old one had not been expired for more than a year, a qualification not contained in the law but which PennDOT is regularly enforcing. Asher Schor is a transgender man (female to male) whose driver’s license has a picture of a woman and says he is female, but because he now looks, dresses and sounds like a man is likely to encounter problems at the polls in November. Many transgender people, especially those who are in the early stages of transitioning and have not yet formally changed their name and gender identity or who have chosen not to make those changes, are likely to be impacted by the law because poll workers are unlikely to accept their ID even if it is valid. Bea Bookler is a 93-year-old woman with limited mobility who uses her walker to get to the polling station next door to her assisted-living facility, but she does not have ID and the burden of getting the necessary documents and the ID itself would be too much for this senior citizen. Many senior citizens who may be hardy enough to vote at their polling places will not have photo ID and will not be able physically to do all that is necessary to obtain ID. Joyce Block is an 89-year-old resident of Doylestown who was rejected for a voter ID by PennDOT because she did not have legal documents proving that her married name on the voter registration really was the same person listed on her birth certificate. Her only evidence was a marriage certificate in Hebrew, which the PennDOT staff could not read. Ms. Block and her family managed to do what most people cannot – they used political connections and influence to get their state senator to pressure PennDOT to overlook the lapse in documentation and issue the ID. Women face extra challenges in obtaining photo ID because of name changes after marriage. The stories of these plaintiffs illustrate the multiple barriers to obtaining state-issued photo ID. To get a PennDOT ID, individuals need to produce a raised seal birth certificate and an official Social Security card. Some people simply cannot obtain a birth certificate because one was never issued, records were destroyed, or because of clerical errors when recording the birth. The non-waivable fee for getting a birth certificate is $10 in Pennsylvania and more in other states, and that doesn’t include the time and money needed for travel and mailing. Others are caught in a catch-22 – with a photo ID required to get a Social Security card and vice versa. Although Secretary of State Carol Aichele has publicly stated that all voters who need a photo ID in order to vote will be able to obtain a free ID from PennDOT, the reality for those seeking these free IDs has been very different. Dozens of reports have been received about PennDOT’s refusal to issue free IDs, insisting, for example, that people must pay because they have had an ID in the past, their ID has not been expired long enough, they don’t replace lost ones for free, or people with outstanding child support or fines don’t qualify for free IDs. “The power of the ballot box is the highest impact strategy there is to help low income people get the basics-like education, health care, jobs, houses and safe neighborhoods,” said Jennifer Clarke, executive director of PILCOP, and a member of the legal team. The lawsuit claims that the voter photo ID law imposes a severe burden on the fundamental right to vote in violation of Article I section 5 of the Pennsylvania Constitution, which states that, “Elections shall be free and equal; and no power, civil or military, shall at any time interfere to prevent the free exercise of the right of suffrage.” It also alleges that the ID requirement illegally adds a new qualification for voting. Article VII section 1 of the state constitution only requires that people be 18 years of age, U.S. citizens, and residents of Pennsylvania and their voting district. Finally, the suit claims that the voter photo ID law irrationally distinguishes between in-person and absentee voters because the latter can vote without photo ID (just by writing down the last four digits of their Social Security number). 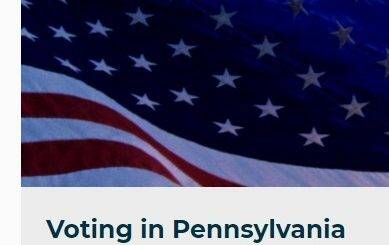 Pennsylvania allows people to vote absentee only if they can demonstrate an impossibility of getting to the polls on Election Day. While in-person voter fraud is virtually nonexistent, there have been far more reports of absentee ballot fraud across the country, yet under Pennsylvania’s law this form of voting is exempt from the photo ID requirement. The case is Applewhite v. Commonwealth of Pennsylvania. Lawyers involved in the case include Witold Walczak of the ACLU of Pennsylvania; Jennifer Clarke of PILCOP; Marian Schneider and Denise Lieberman of Advancement Project; and David P. Gersch, Donna Patterson, John A. Freedman, Michael Rubin, Whitney Moore, Bassel C. Korkor, Dawn Yamane Hewett, Kate Dumouchel, and Daniel Bernstein of Arnold & Porter LLP.